The STM32F334 MCU has an ARM Cortex M4F core along with ADC’s, DAC’s and motor control timers – all of which are useful to me for DSP and motor control. 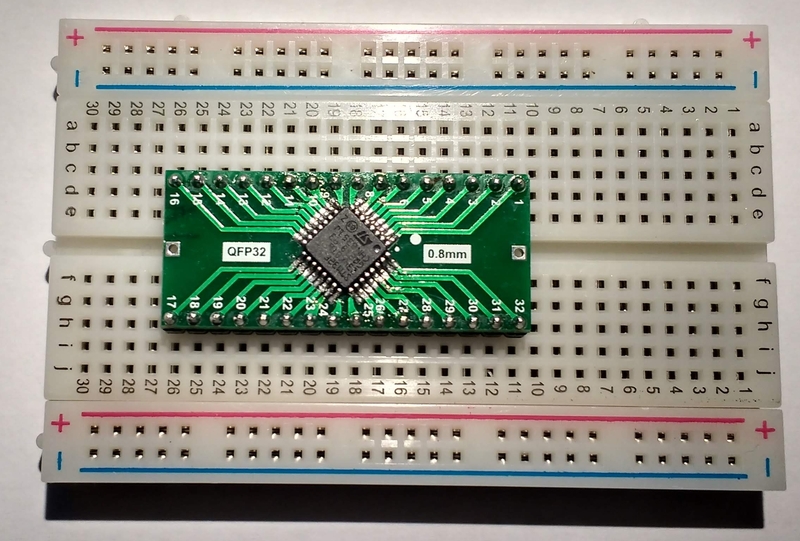 My final intention is to design a couple of PCB’s around this chip so rather than buy a ready made board like the STM32F334 Discovery I decided to work directly with the bare chip. First task is to mount the chip on a breakout board so that I can use it with a breadboard. I used an ST-Link clone from Aliexpress which costs 2 or 3 Euro. In the past I have manually written header files for the various internal peripherals. ST Microelectronics provide a System Volume Description file which can be used with SVDConv to create a header file. This header file relies on other components from the ARM CMSIS libraries spread across various folders. I don’t like this so I added various dummy files (some with zero content) to the same directory as the generated header file. This allows me confine all header files to one directory and is completely standalone. Having done all of this various examples were written and the code repository is over at github. This will grow over time but for now there are examples of blinky, systick interrupts, UART i/o and the ADC.